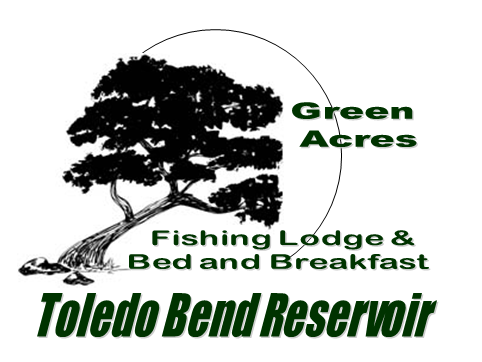 Green Acres Fishing Lodge / Wayne & Lisa Green - Family/Club Unit "Rooster's Roost"
"Rooster's Roost", named after our oldest son, Nathan, whose nickname is "Rooster". This facility is our larger Family or Club Facility that consists of two sleeping rooms that is offered to only one group or family at a time, i.e. you don't share this facility with people you don't know. This is perfect for small, medium, or slightly larger groups or families who are looking for a nice clean sleeping room or rooms when they are visiting the lake. One additional benefit of the Rooster's Roost is the covered parking. The first room (top photo) has 3 queen size beds, 1 full sized bed; the kitchen and bathroom are right off of this room. We have also added an dining table in this room for four guests. 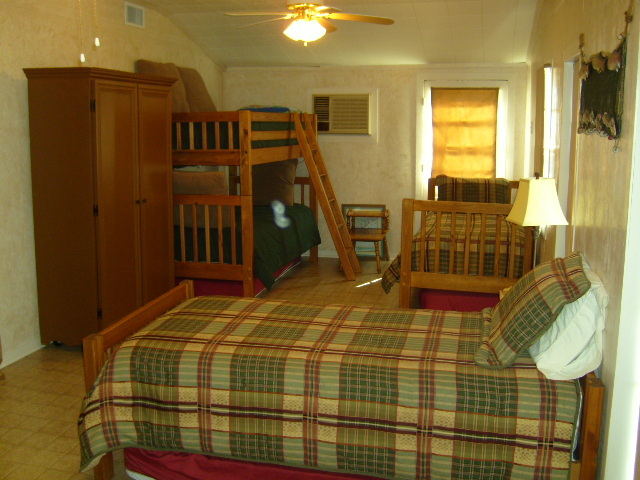 The second room (bottom photo) has 4 twin size beds, this also has seating area for four at a game/eating table. Rooster's Roost is typically used for groups of 4, 8, or even 12 people; however, even individuals have stayed here, call us to discuss your groups needs and we will try to accommodate you. Rooster's Roost is conveniently furnished with linens, bath towels, hand towels, and a TV in each room. However, you are responsible for your own toiletries (tooth paste, soap, shampoo, etc). Rooster's Roost has a new kitchen with all new appliances (photo to the right). The kitchen includes dishes, cups, silverware, etc, as well as, a coffee maker (bring your own coffee), a micro-wave, and a toaster. There is also a covered outside grilling area with a picnic table and other seating available for your convenience. There are nearby restaurants and groceries in the area. When you rent "Rooster's Roost" you are renting both rooms/both sides of the unit, again, you are not sharing with people your don't know. There is a ping pong table, a Foosball table, and a basketball goal available for our Rooster's Roost guests. Additionally, you will have access to our boat house, floating swim deck, the fish cleaning station, and our boat launch. Give us a call to discuss your needs. See our rates tab for details and rates.